Natpe Thunai is Hiphop Tamizha Adhi's second film in a lead role after Meesaya Murukku. The film also stars Eruma Saani Vijay, RJ Vigneshkanth, Shah-Ra, and Anagha in pivotal roles. It is directed by Parthiban Desingu, and written by Sreekanth and Devesh Jeyachandran. The film is produced by Sundar C and Khushbu Sundar under the banner Avni Movies. The team has now released the video of the viral song - 'Single Pasanga'. 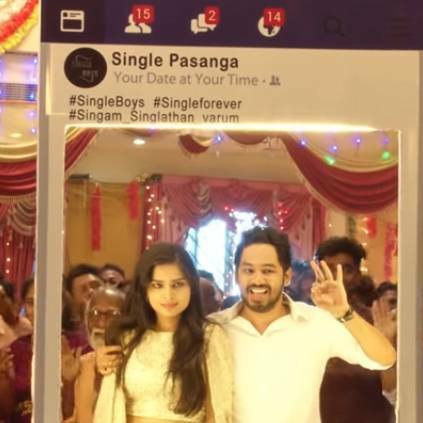 Single Pasanga is sung by Kaka Balachandar, Gana Ulagam Dharani, Arivu, and penned by Arivu. Hiphop Tamizha has scored the music for this commercial entertainer, including this song. The cinematography is by Aravinnd Singh and the film is edited by Fenny Oliver. The film is performing well at the box office, and is expected to do good in the coming days too. People looking for online information on Anagha, Avni Movies, Hiphop Tamizha, Natpe Thunai, Sundar C will find this news story useful.